In today’s digital era, chess players of all levels turn to chess engines as their chess analysis oracles. But these chess engines do not explain their recommendations, leaving most players with an answer sheet that lacks the most important element for learning – Explanations. 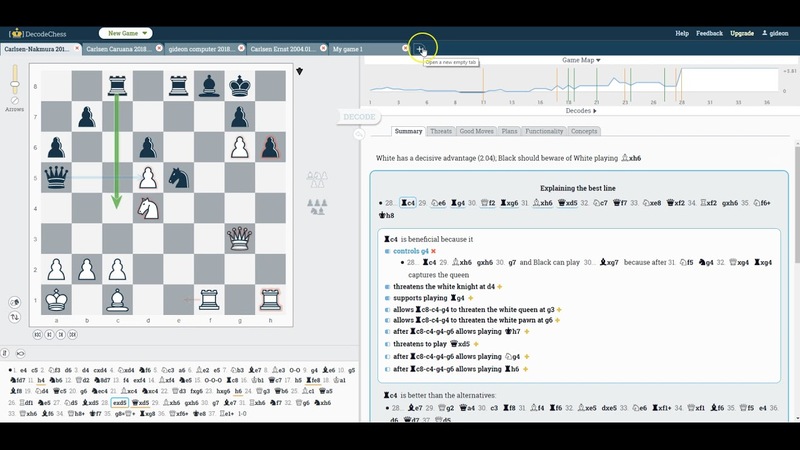 DecodeChess introduces explainable AI to the world of chess analysis, opening the black-box of the world’s strongest chess engine. In the absence of a chess tutor or any other structured training framework, you won’t always have the proper answers to these super important questions. This is probably why many non-professional players have turned chess engines into their go-to analysis pals. These pals are indeed very good in finding the best continuation: A chess engine contains a search function that can calculate millions of possible continuations from a given position, and an evaluation function that operates as a knowledge base to estimate the positional factors of the position. The combination of those two components creates a monstrous chess player which can find very good paths and usually recommends the best moves to play. In addition, chess engines are found in every popular online chess playing platform (lichess, chess.com, chess24, etc.) and can even be downloaded freely to your own computer. However, a chess engine does not understand the position the way we humans do. It solves the problem of finding the best move by searching many positions and cannot explain why it recommends this move over another. That’s why chess engine analysis can easily turn into an indecipherable cheatsheet; even if motivated, you might find yourself “lost in translation”, unable to convert your mistakes to success on your next game. If we humans wish to play chess better, we must improve our understanding and learn how to find the answers by ourselves. DecodeChess developed groundbreaking Explainable AI algorithms which generate explanations for the recommended moves of a chess engine (Stockfish), bridging the gap between machine recommendations and human thought and taking chess engine analysis to a new frontier. Chess Analysis Spotlight – One Move, Yet So Many Outcomes!